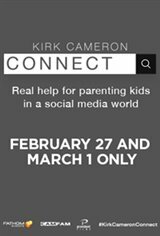 Fathom Events and Provident Films present Kirk Cameron: CONNECT - Real help for parenting kids in a social media world in movie theaters nationwide for two nights only on February 27 and March 1, 2018. In a social media-centered world, the smart phone has become a cultural rite of passage for kids. But is that rite all wrong? How can this generation of parents equip their kids to thrive in an ever-changing digital environment while steering clear of the dangers that lurk nearby? If you're committed to raising kids who will make an impact in this world, join Kirk on this important journey of discovery in his brand-new documentary.